Thanksgiving – an epilogue of sorts | Be The Best. It’s been about 6 months since I last logged into the blog. In fact I just checked and the last blog post was on the Easter weekend, exactly 6 months ago today. Many things have changed in the past 6 months. We’ve downsized, we’ve moved (yah, not really the same thing…), and I’ve changed jobs after 21 years. They say you shouldn’t do all those things at the same time but I guess we missed that part in the instruction manual. I miss Chris everyday, every hour and every minute. You can’t grow back a limb. You learn to live with a broken heart and that’s the way it is. And is that so bad? I mean that actually….is that so bad? As I watched the Olympics this summer and saw Oscar Pistorius win and lose his races I could not help but think about this same fact. He’ll never have ‘normal’ legs but the path he has chosen is a ‘Be the Best’ story if I’ve ever heard one. And so, with this major part of our lives missing and not coming back, how do we tackle our life olympics? One of the things I saw in Mr. Pistorius was zero self pity and only resolve. I loved it. Instead of bitterness, he was thankful and hopeful and energized. We aim to follow his lead. In that vein, here at Thanksgiving there’s a story that I must share. 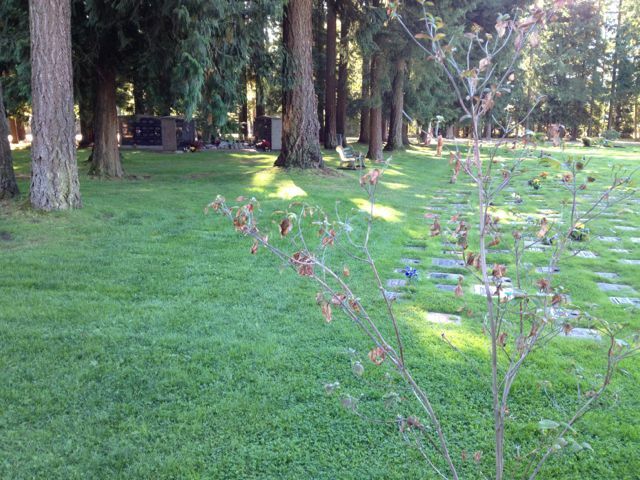 Chris’ ashes are held in a cemetery in Langley. It’s a beautiful place surrounded by huge trees. It’s a great place to remember Chris but also to think about how to push forward and run the race ahead of us and even enjoy that run until we meet again. 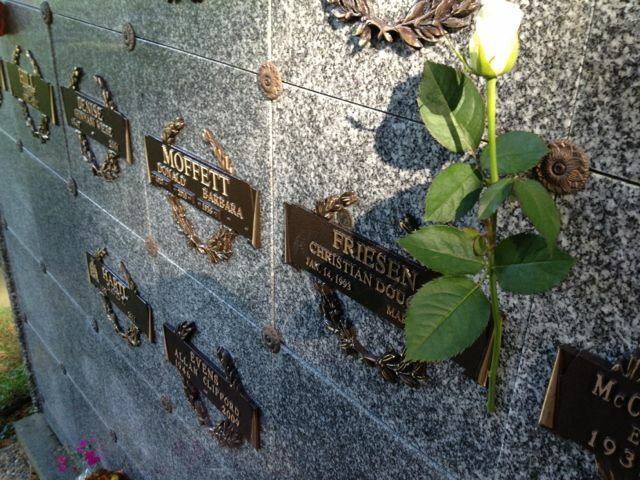 His marker is on the Dogwood Wall and is number 41. This symbolizes the number he wore representing BC when he played nationally and of course the Dogwood is BC’s provincial flower. In honour of that symbolism, a Dogwood tree had been given to us. We aimed to keep it in a big container to manage the growth but with the move the tree was pretty much done. I talked to Dave who works for the Township at the cemetery. Dave’s one of those guys you meet and then you don’t mind paying your taxes anymore. He’s a great guy with a warm heart. 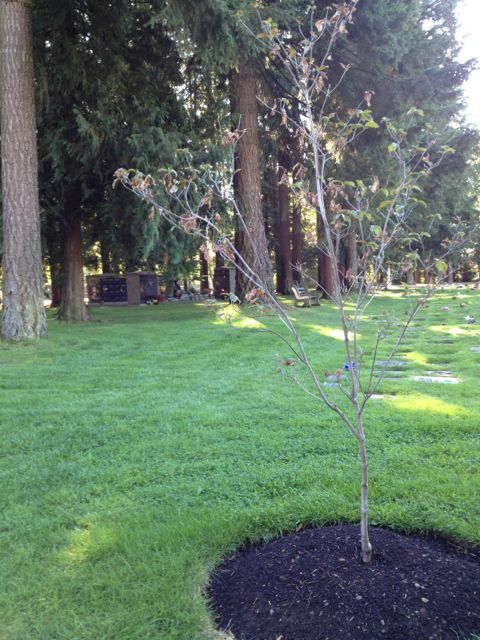 When I asked if he would consider planting the tree he said he would. He took our beleaguered tree and planted it last month. This weekend on Thanksgiving, we saw it for the first time. We were not even sure if it would survive, but it’s doing more than that. It’s thriving and looks like it is giving itself a fighting chance for the winter ahead. We’ll call it the Be the Best tree. It was down, it was almost out, but it came back. Chris’ legacy is one that he now gets to be with us all of the time. He’s with you as you read this in college thousands of miles from home. He’s with you as you lace up those lacrosse boots for another battle. He’s with all of us as we make decisions about our lives. He provides that spirit and inspiration to push hard and Be the Best. For that I am extremely thankful. Randy, thank you for sharing, always love reading your posts, and I know that my kids visit with Chris from time to time. All the best in your new life adventures and Happy Thanksgiving! loved reading this and seeing the pic of the tree. so beautiful. Just so beautifully written … Big hugs to all of you as you have truly touched my heart today. Sending lots of love & positive, uplifting thoughts of encouragement your way … xxoo Susan Vandergoot …. My mom and dad are in the same cemetery. I was just in Langley in August. I should of dropped by. I look forward to seeing Chris’ dogwood next summer flourishing. I’m glad you found a wonderful home for it. Thank you for the inspiration from these posts. God bless you, Ingrid and Max. And as for Chris, well he is the lucky one. I recently heard the man with no arms or legs, Nick Vijicic. Pretty amazing man. Born without limbs he exudes a positive outlook on life. One day in the Lords courts is better than thousands elsewhere!